What Type of Marketing Agency Should an eCommerce Company Hire? Could working with the right marketing agency be what makes or breaks an eCommerce business? A new study of over 150 eCommerce businesses, conducted by DesignRush, has provided insights into the types of agencies that businesses utilized in 2018 and are projected to utilize in 2019. The results offered clear insights into what the most effective marketing strategies are for businesses looking to grow. Respondents were asked questions about ROI, investments, and agency utilization relating to the major marketing channels, consisting of social media marketing, SEO, paid search ads (PPC), and offline advertising. Of these five categories, one emerged as a clear winner: social media. Most of the eCommerce businesses surveyed were smaller, with less than 10 employees, to businesses with over 10,000 team members. On the low end, annual incomes were less than $500,000 — on the high end, over $40 million. The companies surveyed conducted business on the most popular eCommerce platforms, including Amazon, and also used their own eCommerce websites and mobile apps. Marketing agency utilization questions related to each of the aforementioned marketing channels. For example, an agency that helps a company with the SEO marketing channel may be known as an SEO agency. Let’s dive into some of the important discoveries made by this study, which will offer valuable insights for eCommerce businesses of all sizes. In 2018, two-thirds of eCommerce businesses worked with a marketing agency of some kind. This number is slated to increase by more than 5% in 2019. Social media marketing agencies were utilized more than any other type of agency. 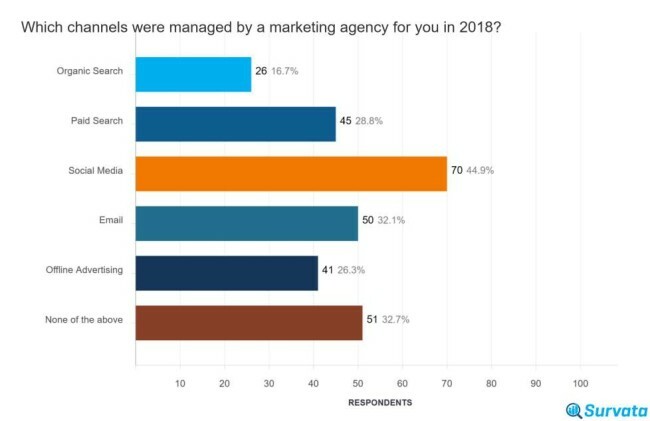 45% of all respondents used an agency to manage their social media in 2018. In 2019, this number is expected to increase. While companies are planning on increasing agency use overall, offline advertising and email marketing agency utilization remains stagnate, at a relatively low percentage. SEO, PPC, and social media marketing all saw an increase from 2018 to 2019. 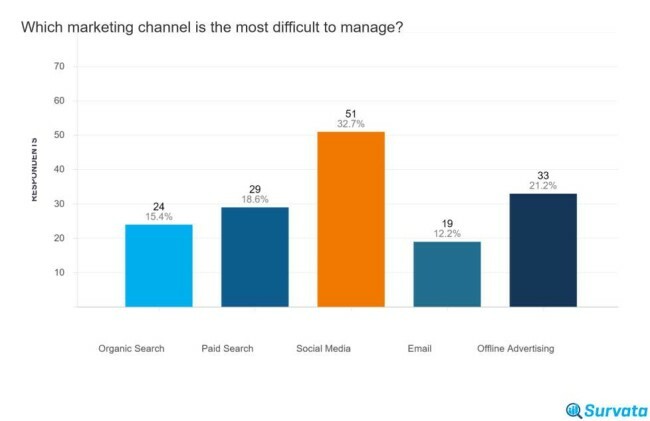 When asked about which marketing channels were most difficult to manage, social media took the top spot. 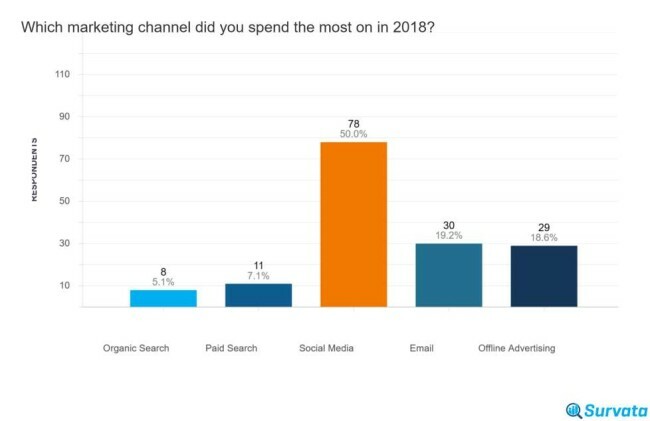 Companies making between $10 million and $20 million had the most trouble with the channel, with a staggering 60% saying it’s the most difficult to manage. Many companies also reported that social media was the easiest to manage, revealing a polarity in social media experience among eCommerce companies. 52% percent of respondents say that their marketing budget will increase in 2019. Nearly half of all respondents said they plan on increasing social media spending with paid search — more than SEO, PPC, and email marketing combined. 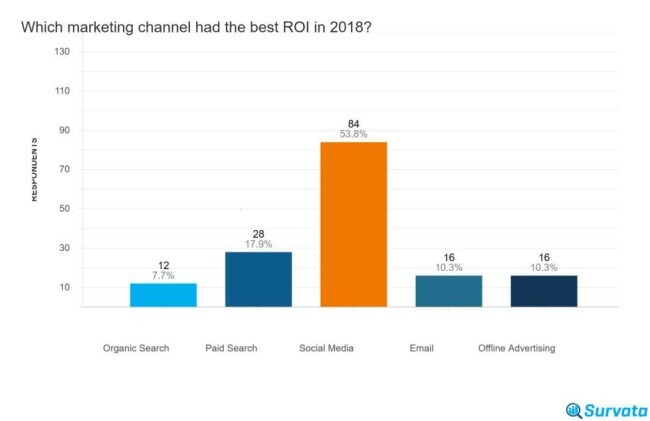 When asked about which marketing channel provides the best ROI, social media held the top spot with 54% of respondents. While full-service agencies can assist with a wide variety of marketing elements, some businesses have to prioritize the channels that they take on. Considering the reported difficulty that many eCommerce companies have with social media — combined with the high ROI — it’s no wonder why many companies are utilizing social media management agencies. What Types of Marketing Agencies Did Companies Use in 2018? 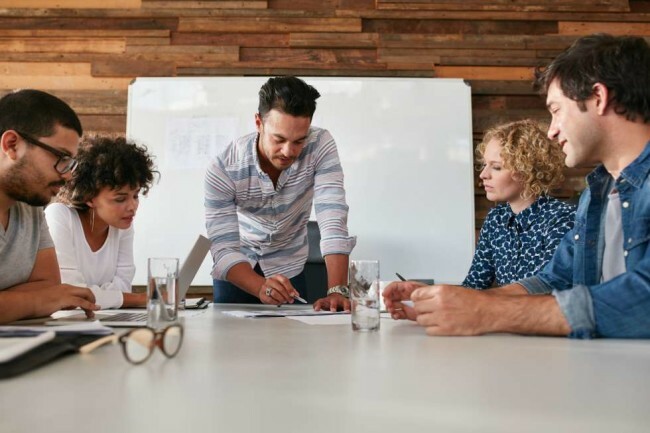 66% percent of all companies surveyed utilized a marketing agency in 2018. Social media was the primary channel that agencies managed, with 45%. Despite the popularity of SEO as a marketing tool, less than 17% of companies worked with an SEO management agency. We also wanted to know what the future looked like for eCommerce businesses in terms of agency use. 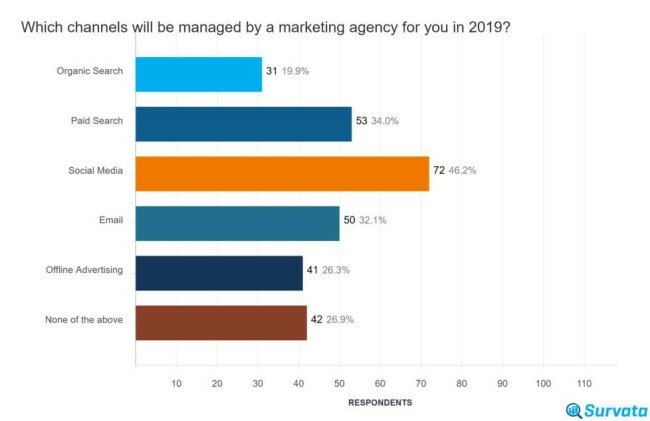 73% percent of eCommerce businesses plan on using a marketing agency of some kind in 2019. That’s up 6% from the previous year. Social media marketing agencies are still at the top spot, with 46% of businesses reported that they’ll use one. Offline advertising and email marketing agency utilization remained flat. Why Are Companies Using Social Media Agencies? Social media marketing is popular for its low cost — businesses can advertise on Facebook for as little as a dollar a day. Since social media is integrated into many of our personal lives, the basics of posting content and replying to comments are well understood by much of the public. However, when social media interaction expands to the business scale, the amount of regular engagement that is necessary can be difficult for companies to keep up with. 33% percent of respondents said that social media is the most difficult marketing channel to manage. Larger companies reported even higher levels of difficulty. 38% percent of companies that make between $5 and $10 million and 60% of companies earning $10 to $20 million gave similar responses. Smaller businesses saw a bump in offline advertising difficulty. Over a quarter of companies with sales of less than $500,000 reported that it’s the hardest to manage. Sage Advice reports that time management, consistency, and content creation are the primary challenges that businesses face when it comes to managing social media. 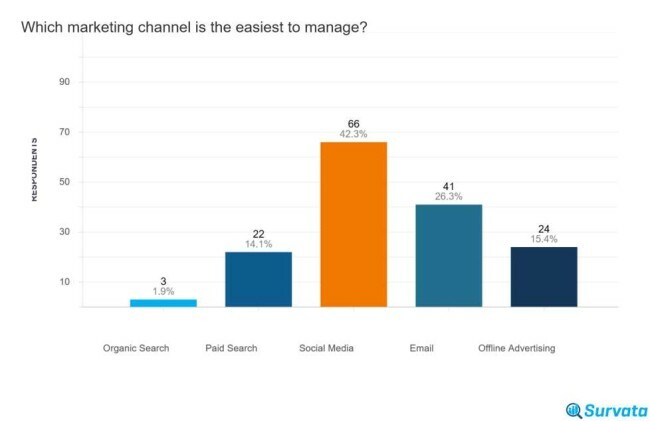 Survey respondents were also asked about which marketing channel is the easiest to manage. A high number reported that social media is actually the easiest channel for them to deal with. As mentioned earlier, this may be because of the familiarity that casual social media users have with the platforms. 42% percent of respondents said that social media is the easiest channel to manage. 75% percent of total respondents said that social media is either the most difficult or the easiest marketing channel to manage. This leaves very little middle ground for those that don’t feel strongly either way. Email marketing and offline advertising were the next easiest channels to manage, with 26% and 15%, respectively. Those who claim that social media is the easiest may be utilizing the help of an agency or social media management tools. Our survey found that an increasing amount of eCommerce businesses are planning on stepping up their marketing investments. 50% of businesses surveyed reported that social media was their biggest marketing expense in 2018. That’s equal to all of the other marketing channels combined. Smaller businesses spent even more, with 61% of companies making less than $500,000, giving it the top spot. Social media marketing remains in the top spot with 48%, with the largest planned increase moving toward paid search, which jumped ten percent. For companies making between $1 and $5 million, 57% say social media will be their biggest expense in 2019. Over half of the total survey respondents say they plan on increasing their spending on marketing in 2019. Which Channel has the Best ROI? For businesses looking to invest in a marketing agency, they need to know that the channel they are delegating to the agency will have a positive ROI. 54% percent of eCommerce companies surveyed said that social media provided their best ROI. For companies making between $1 and $5 million, 64% reported similarly. Facebook is the primary driver behind the high social media ROI, according to a report from DesignRush. The goal of this study was to discover which marketing channels are the best investment for eCommerce businesses. One of the primary investments a business can make is to partner with an agency which specializes in a given channel. Our survey found, conclusively, that social media management agencies are the best marketing channel investment for eCommerce companies. Whether companies find social media difficult to manage or not, the high ROI of the channel provides adequate incentive for businesses to partner with an agency. Facebook, Twitter, and Instagram all require consistent engagement to be effective, which is beyond the scope of many businesses. Social media agencies help companies maintain a strong online presence across various channels. For companies looking to maximize their marketing potential, a social media marketing agency is recommended. Our survey clearly shows that social media is the preferred marketing channel for eCommerce businesses, and investments into the channel are worthwhile. This begs the question: Could your business benefit from the use of a social media agency? DesignRush helps companies find the right agencies to meet their marketing goals by comparing reviews, bios, and budgets. If you’re looking to find the perfect social media partner for your brand, check our list of top social media agencies and get started today!